But who hath something to hope, or something to fear." His lordship, however, kept on good terms with Swift, and obliged him by conferring preferment on Dr. Sheridan, and others of his friends. Even in the Drapier’s Letters, the dean expressed a very high opinion of the lord- lieutenant. 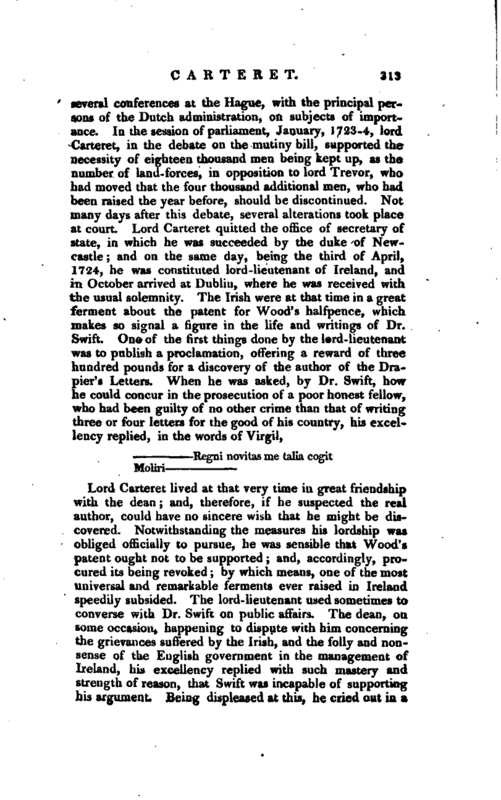 Besides revoking Wood’s patent, lord Carteret’s administration was, in other respects, very acceptable and beneficial to the Irish. He discharged the duties of his high station, in general, with wisdom and fidelity, and the people were happy under his government. 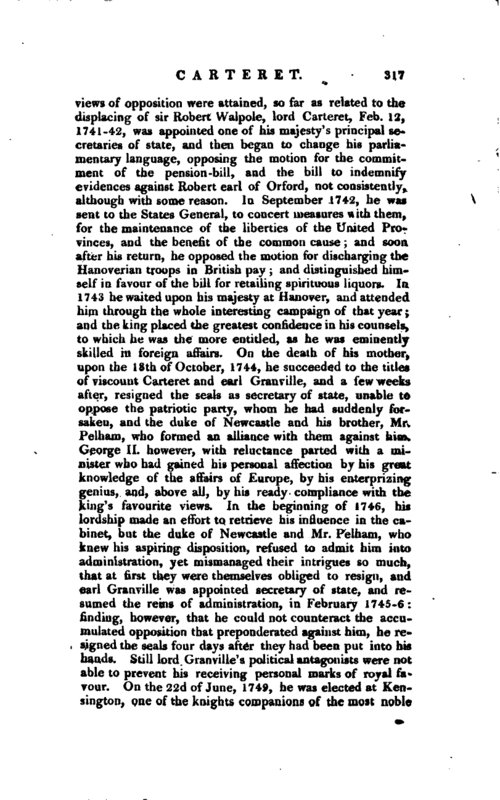 After the close of the session in March, 1725-6, his lordship having constituted lords justices during his absence, embarked for England, where he arrived in May, 1726, and received his majesty’s approbation of his prudent conduct. On the 24th of January, 1726-7, lord Carteret ably defended the king’s speech, which had been warmly animadverted upon by the opposition. 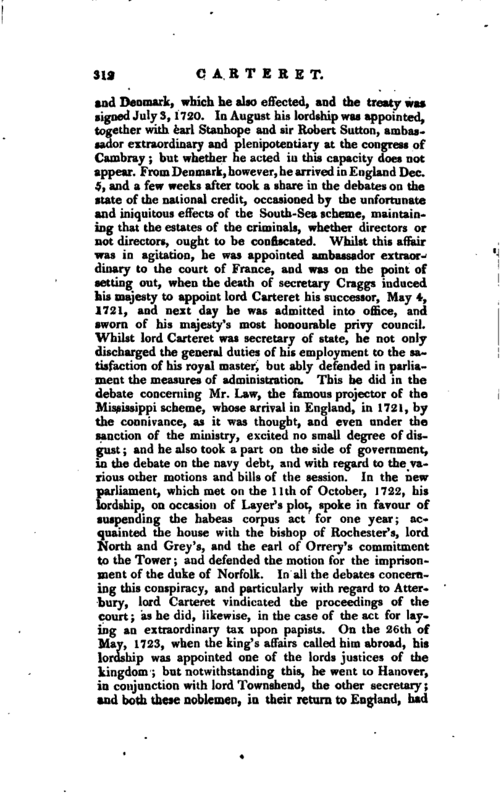 On the 31st of May, 1727, he was appointed one of the chief justices during his majesty’s absence, and upon the decease of George I. who died suddenly at Osnabrug, in his way to Hanover, on the llth of June, 1727, lord Carteret was one of the old privy council who assembled at Leicester house, where the new king was proclaimed. This was on the 14th of June, and the same day he was sworn of his majesty’s privy council. On the 29th of July following, he was again appointed lord lieutenant and chief governor of the kingdom of Ireland, and having arrived there, the parliament was opened, by his excellency, Nov. 28, and the session continued till the 6th of May, 1728, when he gave the royal assent to twenty public acts, and concluded with a speech, expressive of his high regard for the welfare of the kingdom. 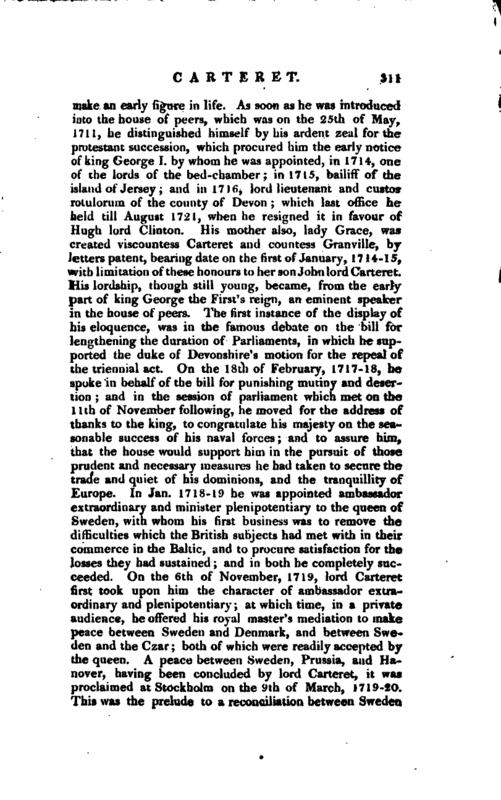 After this, he embarked for England, but in 1729, returned again to Ireland, and held another session of parliament, which began on the 23d of September, and on the 15th of April, 1730. His lordship’s second | vicegerency over the Irish nation was as popular, if not more so, as the first. His polite and sociable manners were highly acceptable to all ranks of people. What particularly recommended him was, his being above the little distinctions of party. 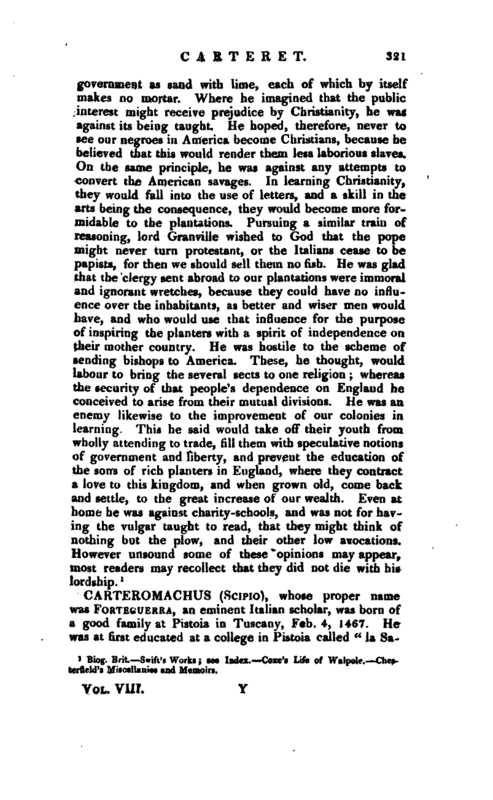 He maintained a good correspondence with several of those who were called or reputed tories, and occasionally distributed a few preferments, of no great significance, in that line. 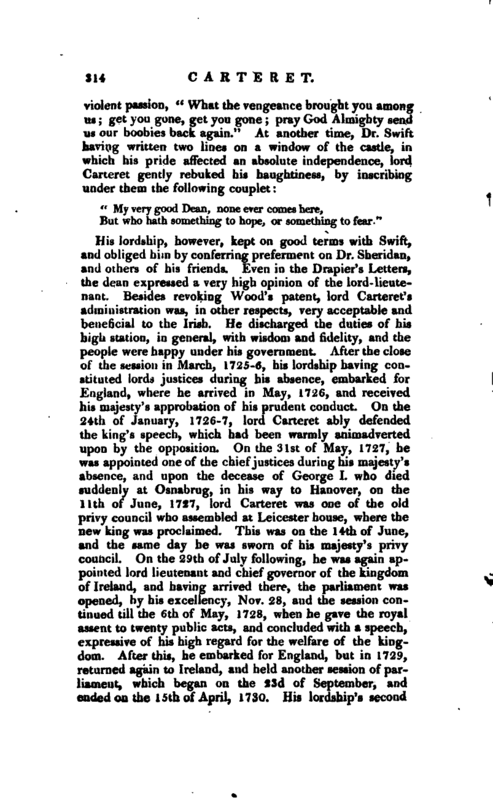 This having excited the complaint of some of the bigotted whigs, gave occasion to a facetious and sensible tract of Dr. Swift’s, entitled, “A Vindication of his excellency John lord Carteret, from the charge of favouring none but Tories, Highchurch-men, and Jacobites.” With Dr. 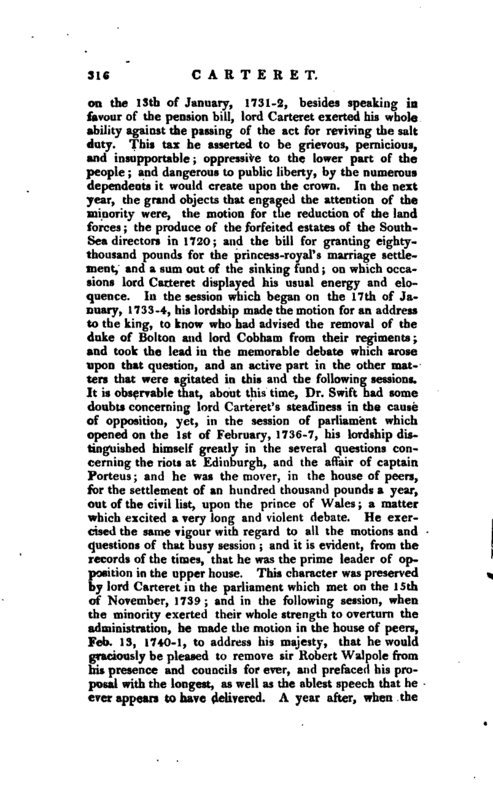 Swift the lordlieutenant appears to have maintained a strict friendship; and he was solicitous to act agreeably to the dean’s views of the interest of the kingdom. In one of his letters, written to the dean some years afterwards, he thus expresses himself; “When people ask me how I governed Ireland? 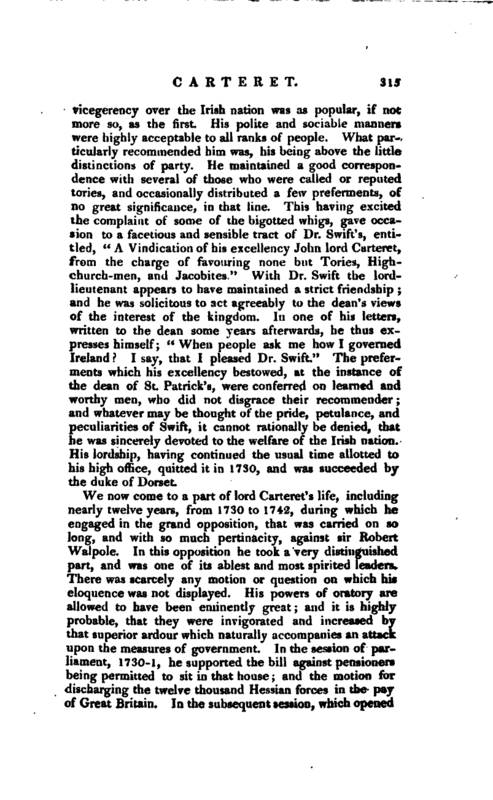 I say, that I pleased Dr. Swift.” The preferments which his excellency bestowed, at the instance of the dean of St. Patrick’s, were conferred on learned and worthy men, who did not disgrace their recommender; and whatever may be thought of the pride, petulance, and peculiarities of Swift} it cannot rationally be denied, that he was sincerely devoted to the welfare of the Irish nation. His lordship, having continued the usual time allotted to his high office, quitted it in 1730, and was succeeded by the duke of Dorset. 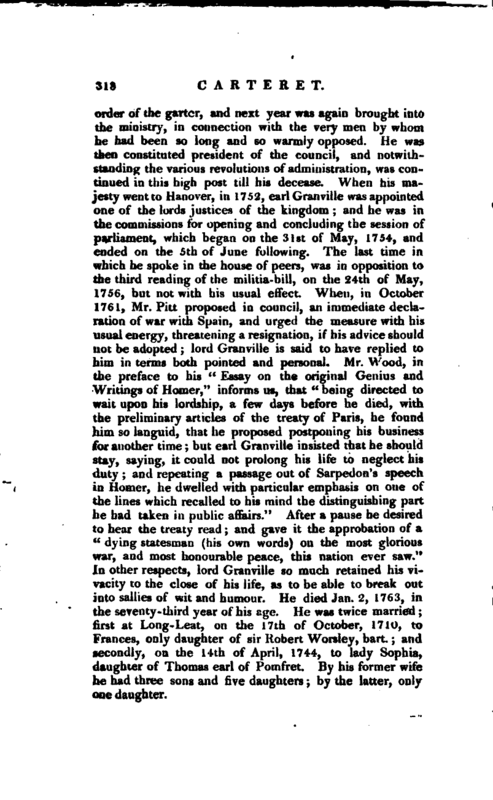 The late duke of Newcastle used to say of lord Granville, that he was a man who never doubted. From his lordship’s acknowledged literature, it may naturally be supposed that he patronized learned men and learned undertakings. His regard for Dr. Swift, and his attention to the dean’s recommendations, we have already mentioned. He assisted and encouraged Mr. Lye, in his edition of Junius’s Etymologicon, and the learned Mrs. Grierson of Dublin, when he was lord lieutenant of Ireland. 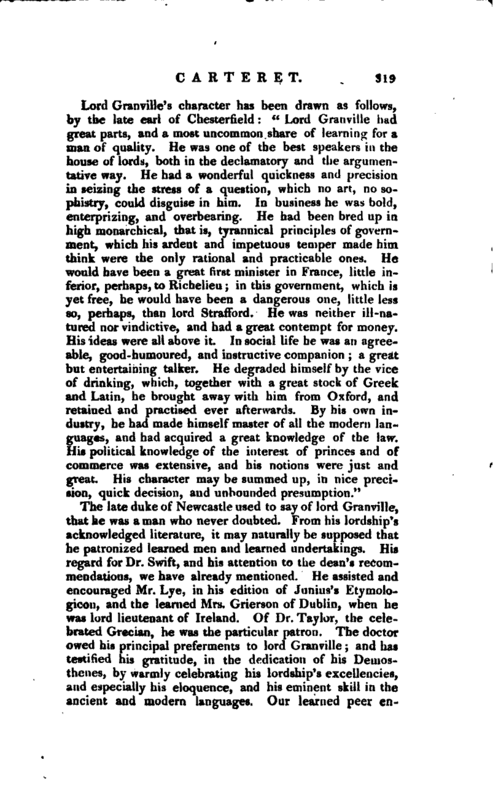 Of Dr. Taylor, the celebrated Grecian, he was the particular patron. 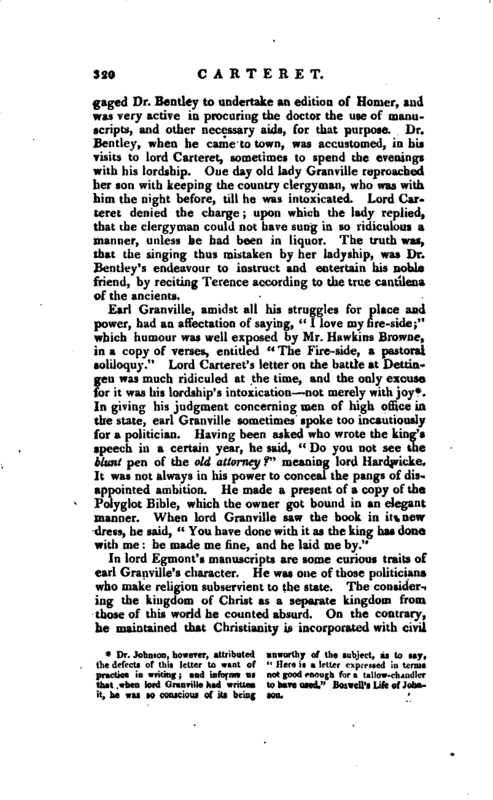 The doctor owed his principal preferments to lord Granville; and has testified his gratitude, in the dedication of his Demosthenes, by warmly celebrating his lordship’s excellencies, and especially his eloquence, and his eminent skill in the ancient and modern languages. Our learned peer | engaged Dr. Bentley to undertake an edition of Homer, and was very active in procuring the doctor the use of manuscripts, and- other necessary aids, for that purpose. Dr, Bentley, when he came to town, was accustomed, in his visits to lord Carteret, sometimes to spend the evenings with his lordship. One day ojjl lady Granville reproached her son with keeping the country tler^yman, who was with him the night before, till he was intoxicated. Lord Carteret denied the charge; upon which the lady replied, that the clergyman could not have sung in so ridiculous a manner, unless he had been in liquor. The truth was, that the singing thus mistaken by her ladyship, was Dr. Bentley’s endeavour to instruct and entertain his noble friend, by reciting Terence according to the? true cantilena of the ancients. Dr. Johnson, however, attributed the defects of this letter to want of practice in writing and informs us that when lord Granville had written it, he was so conscious of it being unworthy of the subject, a^ to say, “Here is a letter ixpif-std in terms not good enough for a tallow-chandler to have used.” Boswell’s Life of "Johnson. In giving his judgment concerning men of high office in the state, earl Grauville sometimes spoke too incautiously for a politician. Having been asked who wrote the king’s speech in a certain year, he said,” Do you not see the blunt pen of the old attorney?“meaning lord Hardwicke. It was not always in his power to conceal the pangs of disappointed ambition. He made a present of a copy of the Polyglot Bible, which the owner got bound in an elegant manner. When lord Granville saw the book in its newdress, he said,” You have done with it as the king has done with me he made me fine, and he laid me by. " Biog. Brit. 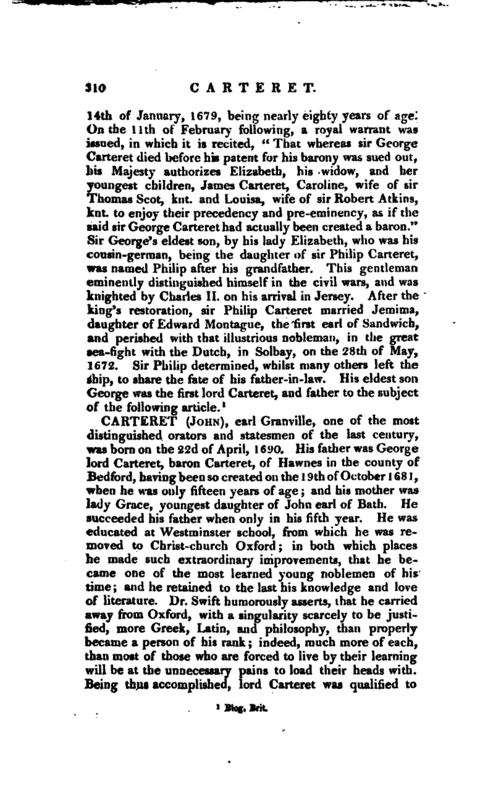 Swift’s Works see Index. Coxe’s Life of Walpolc. Chesterfield’s Miscellanies and Memoirs.